Tree kangaroos are unique macropods who have adapted to a life in trees. Loss of habitat and uncontrolled hunting have forced many species close to extinction. Unlike their close cousins, the tree kangaroo's arms and legs are approximately the same length. Tree kangaroos also have much stronger fore-limbs to help in climbing the trees they inhabit. Tree kangaroos have suffered from loss of habitat, and many species have suffered severe reductions in their range. 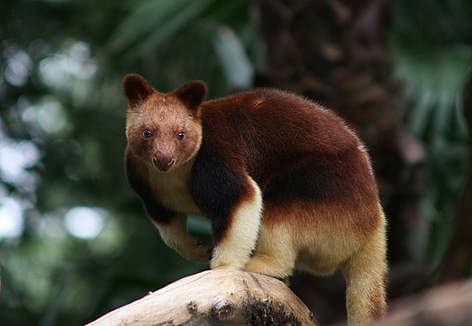 The Wondiwoi tree kangaroo is critically endangered (possibly extinct) with as few as 50 individuals remaining. Similarly, the critically endangered dingiso has suffered a population decline in excess of 80% over the last 30 years. Living in the trees, the tree kangaroo eats mostly leaves and fruit, although they will also collect fruit that has fallen to the ground. The animals will also eat other items such as grains, flowers, sap, eggs, young birds, and even bark. Bennett's tree-kangaroo (Dendrolagus bennettianus) on the branch of a tree. The Bennett's tree-kangaroo is a rare and vulnerable Arboreal marsupial, Australia. The major threats facing tree kangaroo species are hunting and habitat loss. Tree kangaroos have been hunted for food by indigenous communities across their range. For a number of species, this factor alone has contributed to a sharp decline in population numbers. Habitat loss and degradation means that many species now inhabit a restricted range. Habitat has been removed for logging and timber production, or converted to coffee, rice or wheat production. This loss of habitat can also expose tree kangaroos to predation by domestic dogs. Tree kangaroos are a priority species. WWF treats priority species as one of the most ecologically, economically and/or culturally important species on our planet. And so we are working to ensure such species can live and thrive in their natural habitats. Reducing deforestation and loss of habitat caused by illegal logging, including support for FSC certified wood and wood products. 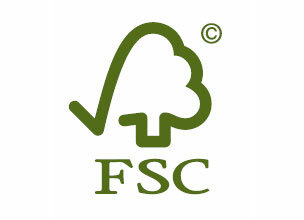 Support WWF's efforts to preserve tree kangaroo habitat - only buy wood or wood products that come from properly managed and sustainable forests which have been certified by the Forest Stewardship Council (FSC). Like all macropods, instead of sweating, tree kangaroos lick their forearms and allow the evaporation to help cool their bodies when hot. 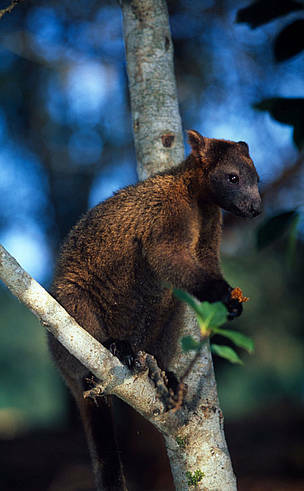 Only 2 species are found in Australia: Bennett’s and Lumholtz’s tree kangaroo.